Just had an excellent visit from my fellow blogger Teddy of Teddy’s Travels, who kindly assisted me with my Lesser Prairie Chicken painting project. The painting you see above will be the poster for the upcoming Lek Treks and More Lesser Prairie Chicken Festival in Woodward, Oklahoma April 17-22. What an assistant Teddy was! 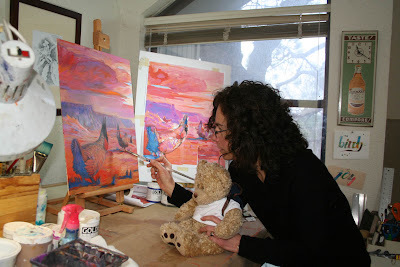 He guided me through color decisions (the bear has an eye for hue) and even helped improve the composition. He then blogged about our day in the studio, with some insightful comments about life, art, and the world of the Lesser Prairie Chicken. It’s good to get guidance for such a big project. Does he charge consulting fees?